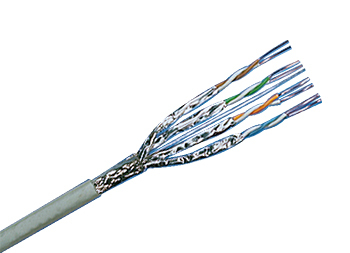 Pair-shielded 100 Ohm installation cable with overall braided screen, suitable for transmission frequencies of up to 650 MHz, 4 x 2 (AWG 23). Compliant with standards ISO/IEC 11801 ed. 2.2, EN 50173-1: May 2011 (DIN EN 50173-1), DIN 44332-5, IEC 61156-5 2nd Ed., EN 50288 x-1, 10GBASE-T in acc. with IEEE 802.3™ Section Four, tested and certified by independent laboratory. Low-smoke in acc. with IEC 61034, flame-retardant in acc. with IEC 60332-1 and halogen-free in acc. with IEC 60754-2.Outer jacket color gray, RAL 7035.